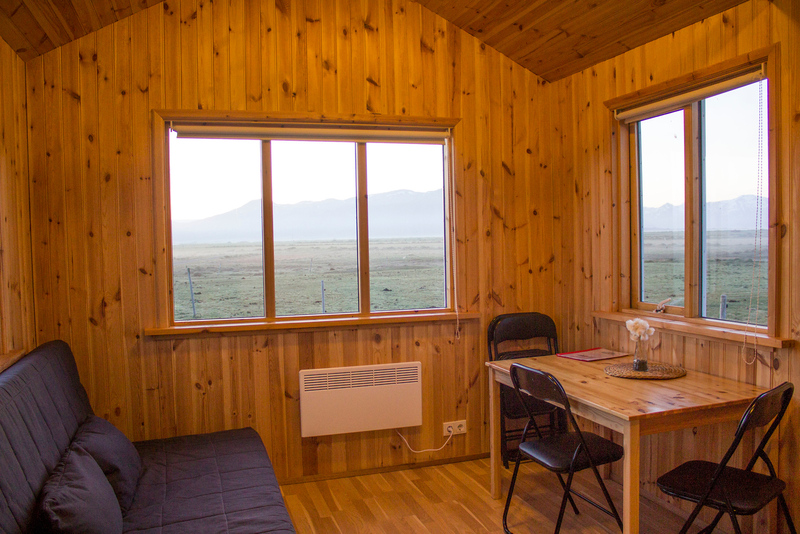 Stay in hand built wooden cottages on a farm with a view. Justin slept in the front seat of the car next to me. I drove ahead. Though it was nearly eleven o’clock at night, it was still light outside. The fog hugged the mountains. It loomed as far as I could see, drifting apart as the car forged onward. A few sheep gathered in the middle of the road with their babies. I slowed and waited for them to wander back to the fields. Justin and I enjoyed a long day exploring waterfalls, black sand beaches, and even the wreckage of an old plane crash. 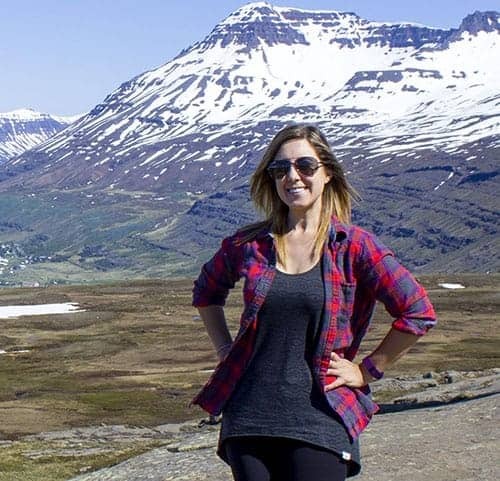 Take the time that you’d think you’d spend at a place in Iceland and double it. We seriously underestimated the time that we thought we’d spend at each attraction. Sometimes it’s difficult to pull yourself away from such breathtaking scenes. As we searched for our accommodation, it was late. We were exhausted and couldn’t wait to sleep. As we approached the entrance to Lambhus Cottages, we were excited to see our home for the night. Flocks of geese welcomed us with their raucous honks. Gentle horses grazed in the distance. Rugged mountains lined the outskirts, serving as a reminder that we were in Iceland – one of the most beautiful places on earth. The accommodation, Lambhus Cottages, is owned and operated by a local family on their farm. 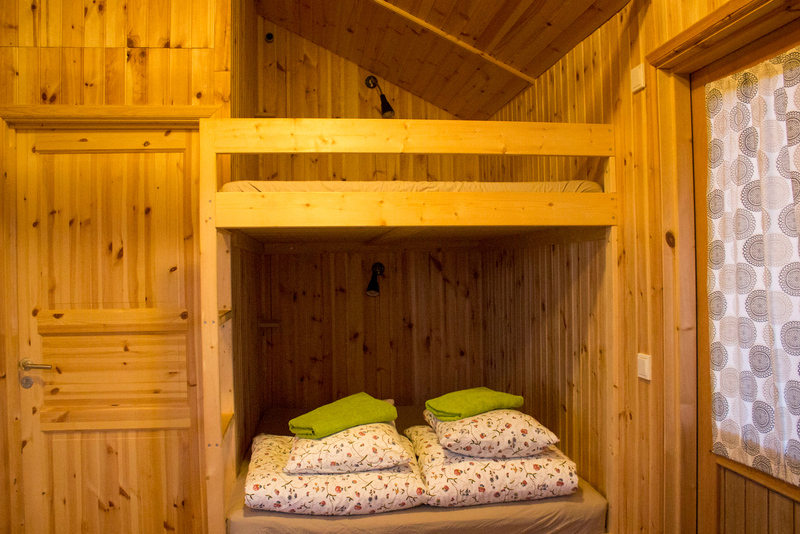 Gunnar is a carpenter; he constructed each cottage by hand. Steinvör is a qualified tour guide who speaks four languages. Their three children also live with them on the farm. Not only were we happy to finally get some rest, this quiet and peaceful cottage was absolutely ideal after our full day of adventures. There were several cottages clustered in one site. We were able to drive our car right up to the front door, which made it easy to unload our belongings. 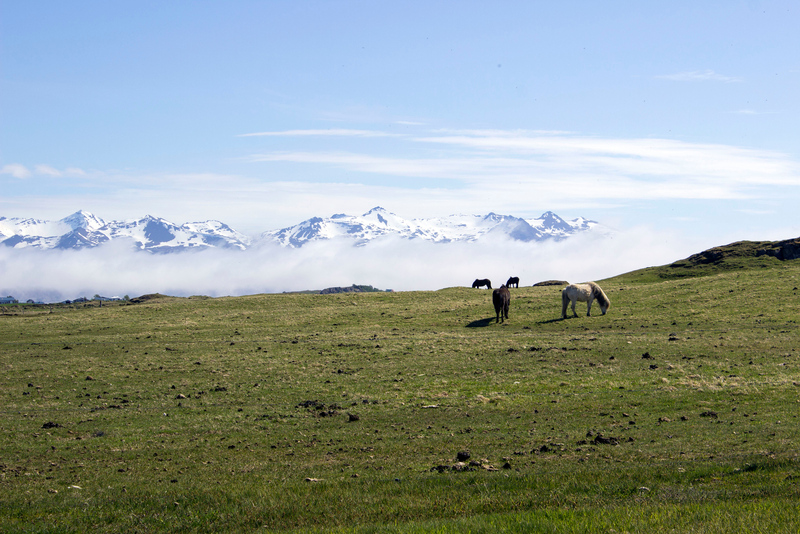 Justin and I stayed at cabin 11, with views of the majestic snow-capped mountains and Icelandic horses. 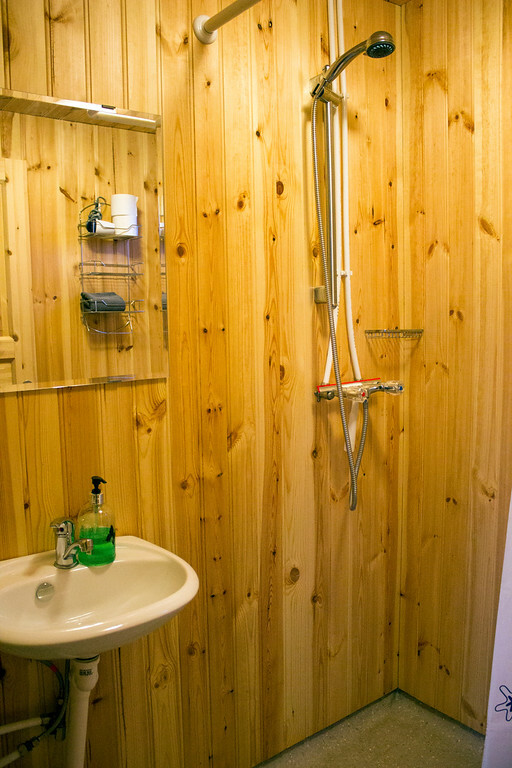 The cottages have everything that you could need for a comfortable stay. They sleep two adults and two children (it’s possible to have four adults stay here, though it might feel crowded.) 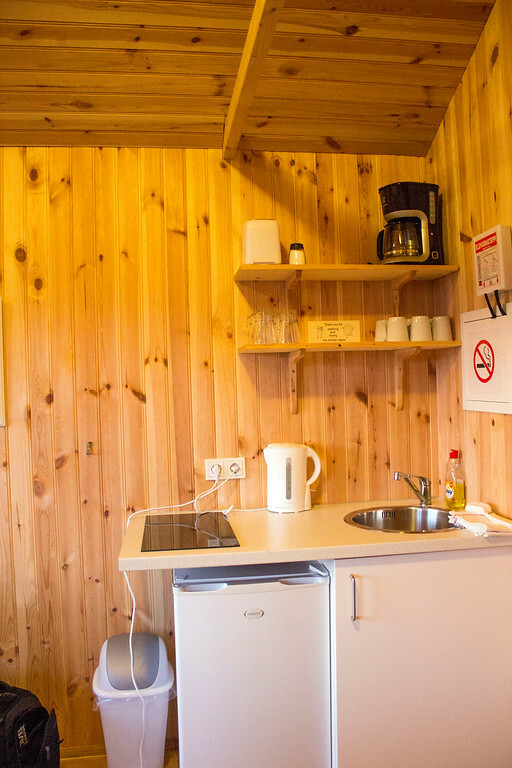 There was a kitchenette with a fridge, two hot plates, pots and pans, a kettle, a toaster, plates, cutlery, and a coffee maker. We arrived late, but we prepared a small meal before going to bed. 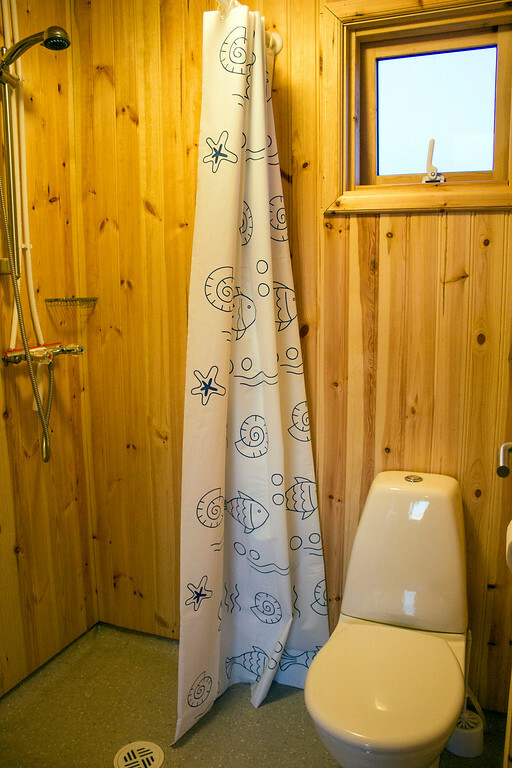 You’ll find a little bathroom in the cottage with a shower and a hair dryer. Here’s a small photo tour of the cottage. Lambhus Cottages was easy to access from the Ring Road (Route 1) – it’s right beside it. You won’t have to make any detour from your road trip around Iceland. Lambhus Cottages isn’t very close to any towns, but that’s part of the appeal. 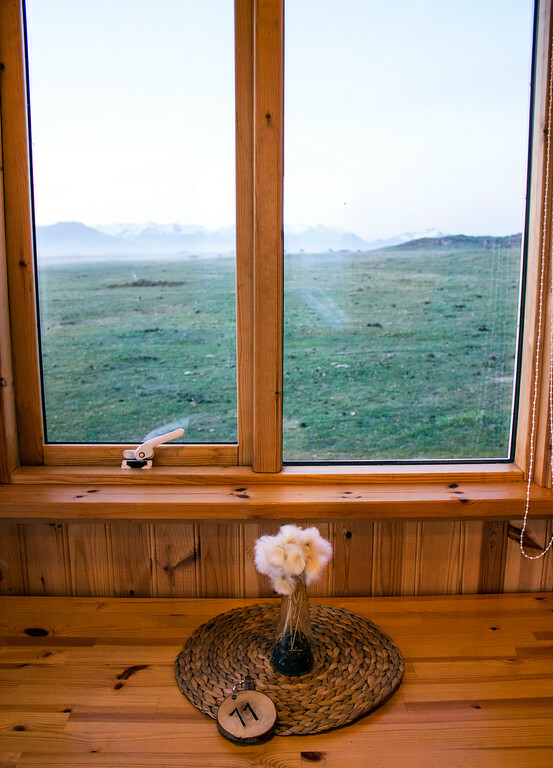 We stayed in the middle of the countryside, surrounded by mountains and rolling grasslands. If you need to head into town, Hofn is about 30km east, We weren’t terribly far from restaurants, grocery stores, and gas stations. It’s about 50km east of the glacial lagoon, Jökulsárlón. 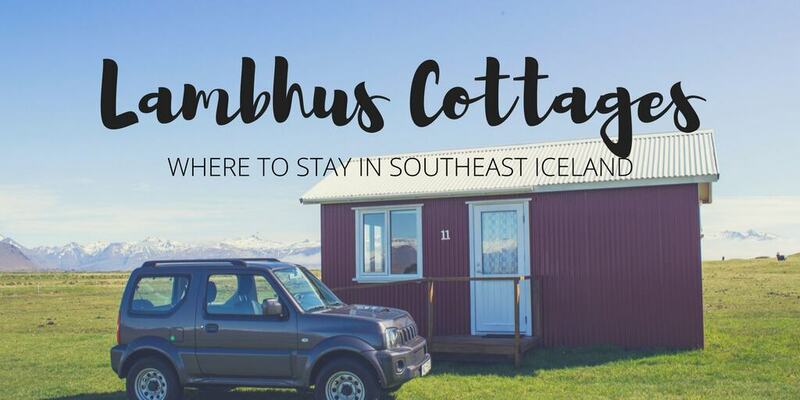 Lambhus Cottages was the perfect base to explore the area, as we made a trip to Jökulsárlón the following morning. As it’s right off the Ring Road, you won’t need any special vehicle to stay there – a regular car will do just fine. Waking up in the morning was the best. 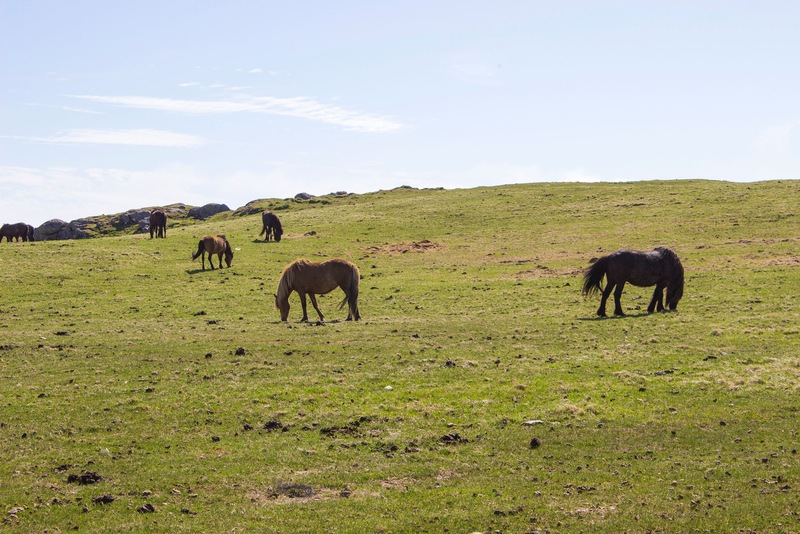 I breathed in the fresh air and caught glimpses of nearby horses munching on grass. It was really easy to stay in touch with this lovely family as we planned our trip. Even on the road that evening, Steinvör was very responsive to our emails. We informed her that we’d be arriving later than we expected. It was no problem at all. The cottage was ready for us upon our late arrival, even after 11:00pm. 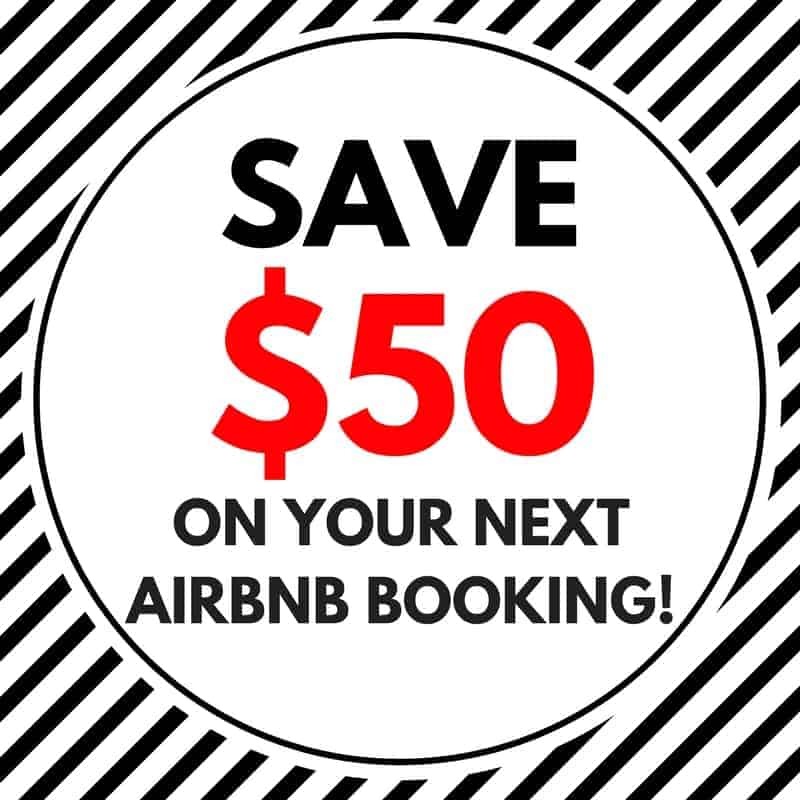 Please note that the cottages are available from June 1st to August 31st. We adored our stay at Lambhus Cottages. 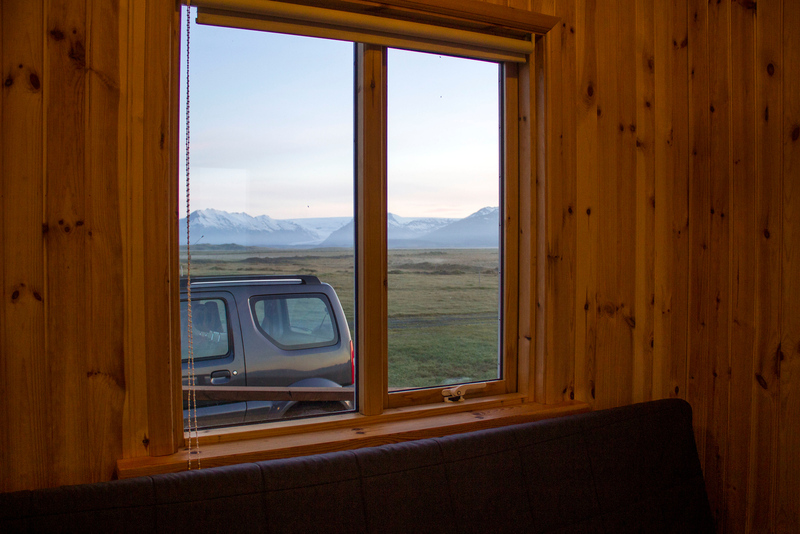 We’d definitely stay here again, and we highly recommend that you book this accommodation when you travel to Iceland. This cute cottage had it all: a full kitchen to cook meals, comfy bunk beads to accommodate up to four people, and a magnificent view. 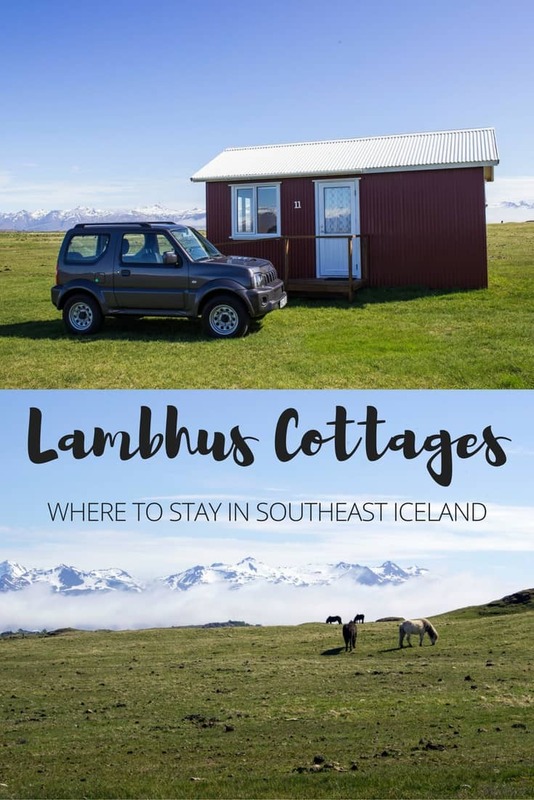 Disclaimer: Thank you to Lambhus Cottages for hosting our stay. Our opinions, as always, are entirely our own. We highly recommend Lambhus Cottages as we had an amazing experience staying there. Perfect; I’ve been looking for a place near the lagoon for our trip next summer and this fits the bill!